This mid-sized sports utility vehicle was first introduced in 2003 and was built on the Altima sedan platform. It was powered by a 245 horsepower V6 engine and available with front-wheel drive or all-wheel drive. In the earlier versions, Murano seated only 4 passengers and had standard antilock four-wheel disc brakes with brake assist. The first generation Murano was available in 2 models; the basic SL and the sporty SE. The features available in this first generation Murano include audio and trip computer functions, tilt steering wheel/gauge cluster, navigation systems, xenon headlamps, leather interior trims, and power-adjustable pedals. Some of these features are optional. One reason why the used Nissan Murano is a smart decision to buy is because the styling still looks as fresh as the new Murano SUV's available in the market. 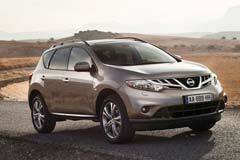 Generally, Murano is quite a solid and sound car that gives very little trouble to the owner. The maintenance costs are also fairly low. These factors make the Nissan Murano a good choice for someone looking for a vehicle with a nice style.